Bald Mountain won't be buzzed by beetle-fighting helicopters this summer, as Forest Service officials report that the Douglas fir bark beetle population has collapsed, meaning Baldy's trees are now out of extreme danger. For the past two summers, helicopters have flown over Bald Mountain dropping MCH pellets on the mountain in an attempt to decrease the amount of damage done by the beetles. MCH, short for methylcyclohexenone, is a pheromone naturally produced by the beetles to let other beetles know that there is no more habitat in a tree, thereby preventing overpopulation in a single tree. By replicating MCH and applying it to trees that have yet to be infested, the Forest Service hoped to trick beetles into staying away from certain areas. And it's worked, according to Ketchum District Ranger Kurt Nelson. "We had almost no [tree] mortality on Baldy last year," he said. 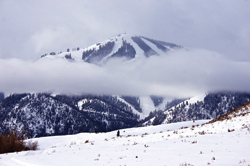 According to a report released in January by the Sawtooth National Forest, the forest lost a total of two trees in 34 treated areas on Bald Mountain in 2011, and eight trees in untreated areas. That's far fewer than in 2010, when beetles attacked roughly 10 trees per acre in untreated areas and about one tree every two acres in treated areas. The 2011 reports show that almost one tree per acre was attacked in untreated areas, while .03 trees per acre were hit in treated areas. "Douglas-fir beetle populations have declined to low levels and no longer pose a threat to this ski area," the recent report concludes. As a result, Nelson said the Forest Service will not contract to send helicopters over Baldy this summer. The Forest Service has spent more than $500,000 on MCH flakes and helicopters in an attempt to preserve Baldy's Douglas firs over the past two years, a price Nelson said was well worth the result. "It's fairly spendy to contract with helicopters," he said. "But you have to compare it with the cost of reforestation. It was a high cost, but it was meant to preserve Douglas fir." Nelson said the Ranger District would continue to focus on thinning trees on Bald Mountain in an attempt to make the remaining tree population more vigorous. Thinning the foliage in the ski area not only allows fewer trees to compete for limited resources, but could also provide more glade skiing. Nelson said the thinning operations would focus along the Upper Warm Springs, College and Limelight runs as well as in the Frenchman's drainage. "It will take several years and it's not inexpensive, but we can increase tree vigor in those areas," Nelson said. "It'll be a win-win for trees and skiers."